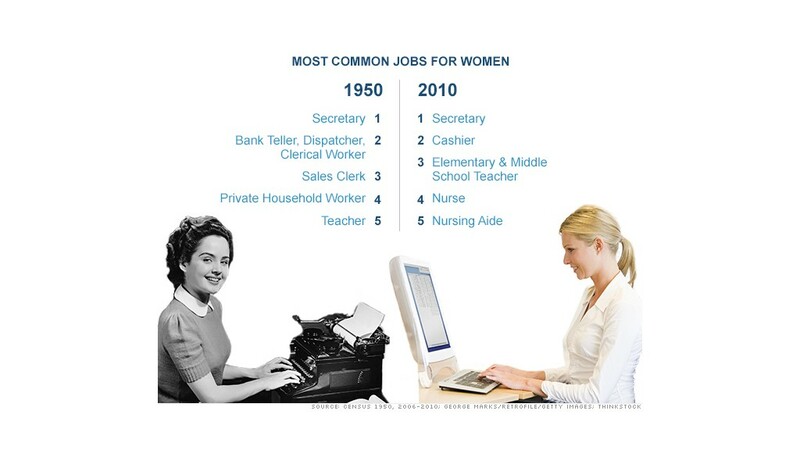 What's the most common job for American women? "It was out with the stenographers, and in with the data processing people. But many women are still employed in that large category," said Cindia Cameron, organizing director at 9to5, National Association of Working Women. Cameron worked as a secretary before joining the organization in 1983. First, generalists tend to dominate the list of most common jobs, regardless of gender. The top job for American men, for example, is truck driver. As workers become more specialized, either with years of experience or education, their job titles tend to become more specific to their industry. So why are so many secretaries still around? "Every time a major new technology showed up, there were always predictions that this would spell the end of secretaries," said Ray Weikal, spokesman for the International Association of Administrative Professionals. "You saw that with the development of electric typewriters, the personal computer, and the internet, but every time technology gets more efficient, the amount of business increases. You continue to need people who can use those tools." Administrative assistant could very well continue to be the top job for women in 2020. The Labor Department projects the category will grow about 12% between 2010 and 2020, adding nearly 493,000 jobs during this decade. The word "secretary," has been falling out of favor for decades, largely due to the feminist movement. In the early 1970s, a group of secretaries at Harvard formed 9to5, a group with a mission to change the image and working conditions for women office workers. Their early demands included written job descriptions, overtime compensation, systematic procedures for filing a complaint, and regular salary reviews. Sister organizations popped up in Chicago, San Francisco and New York and eventually, 9to5 turned into a national organization, with some affiliates joining unions. 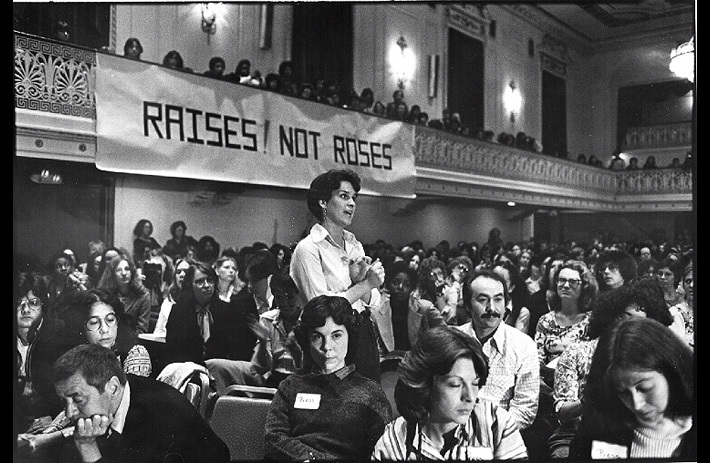 Conventions and marches on National Secretaries Day included the slogan "Raises, not roses." Along with those movements, workplaces started to rename the job "administrative assistant" or "office professional," to reflect the shifting perception of secretaries. The National Secretaries Association eventually changed its name to the International Association of Administrative Professionals. "Increasingly women in the 1970s were demanding the opportunity to be treated as equals," Weikal said. "All of a sudden you have fewer secretaries and more executive assistants." Even, after all that progress, the title "secretary" made a slight comeback in 2011, the first year in decades it had grown, according to an IAAP survey. The organization attributes it to the popularity of the show Mad Men and nostalgia for the 1960s. "It's really hard to watch but it actually makes us think about how far we have come. Now you couldn't get away with half of the stuff men do in the show, and women fought really hard to change that," Cameron said. "It's a pretty hard time period to be nostalgic for, though." 9to5's main mission has since expanded to focus on women in low-wage jobs in general. The organization pushes for fair pay measures, paid sick days and maternity leave. Across all industries and occupations, full-time female workers earned 78 cents to every dollar a man earned in 2010. In the category of administrative assistants, women outnumber men more than 20 to 1, but still earn less than their male counterparts -- about 87 cents to the dollar. Full-time female secretaries and administrative assistants earned an average salary of $34,304 in 2010. For men, it was $39,641. 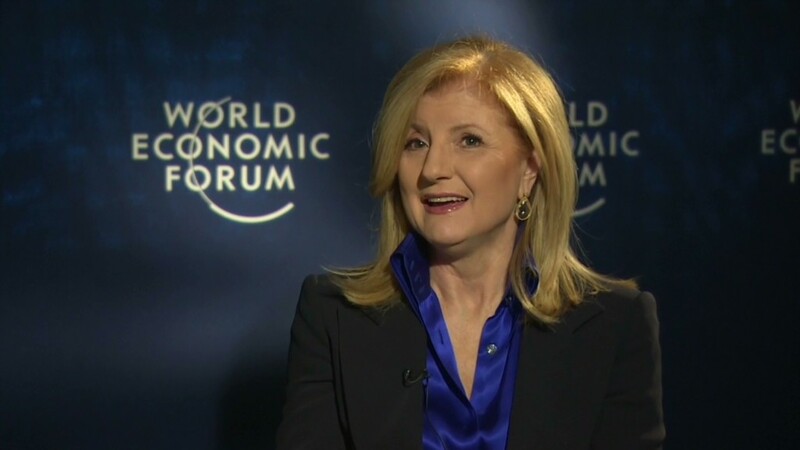 "The good news is over the past 40 years, there are very few jobs in which women have not broken through," Cameron said. "The glass ceiling is cracking in all different directions, but the bad news is, there is still a sticky floor. Most women still work in traditionally female jobs, like administrative support." We're looking for men who work in female-dominated professions like nursing, elementary school teaching, cosmetology, child care and other fields. If you're a guy working in one of these fields, please email Annalyn.Kurtz@turner.com.